Welcome to Walker Engineering - home of the Walker AIRSEP® closed crankcase system for diesel engines. Originally configured for marine applications, the AIRSEP® is now available for all applications that use diesel engines, such as trucks, buses, RVs, Industrial engines, and even power generation. New AIRSEPS® have been designed to meet the increasing popularity of natural gas-fueled engines, as well. For heavy-duty applications, our high-efficiency CCE® series AIRSEP® is the product of choice. Walkers NEW Spinbreather is designed for classic Volvo marine diesels dating back to the late 1970s, 80s and 90s that use an open breather with threaded base. The Walker AIRSEP Spinbreather is a high performance OPEN breather, and replaces the stock metal canister without any engine modification or tools. Walker AIRSEP Awarded GSA Contract. Walker Engineering was recently awarded a GSA contract for Walker AIRSEP products and air filters. 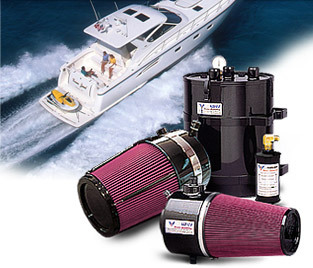 Walker recently released new air filter field service kits for AIRSEP equipped marine engines.